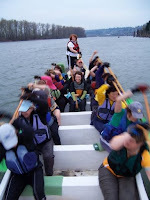 Come support our team at the Rose Festival Dragon Boat Races this year. This is our 7th year paddling. Look for the bright green paddles and join us in our tent! WISH US LUCK! It should be an exciting race weekend for the Miss Fit Dragons! There are about 100 teams racing in total. Come to support me and stay to watch the other teams, too! The first category of races begins around 8 AM on Saturday. You can go to the PKSCA website for more information. Good luck! Row hard! Stay balanced! Have a great time! Can't wait to hear the results.